In March I went down to Virgin City with my wife Susan and planted out my city lot to fruit trees and grape vines, and returned home on the last day of the month. And in April I went to Salt Lake City with my wife Janet and had her sealed to me in the endowment room across the alter by President Brigham Young, and returned home on the 16th of May. In June I went down to Virgin City accompanied by my wife Margaret and in company with my son Nephi and cleared fenced made the water ditches for and planted four acres of land to Sugar Cane, near the mouth of North Creek, and returned home in the fore part of July and soon commenced harvesting my wheat, and continued at various kinds of farm labors until some time in October when I moved my wife Margaret down to Virgin City and having obtained a good Cane mill from the States through the aid of my son Sixtus I went to work and made up my sugar cane into molasses. In November, several of the missionary families that were called to Dixie arrived in Virgin City with the Exploring Committee, Elders Branch, Whitmore, and Golden, who were appointed to look out locations for settlement, mill seats, etc, and by their urgent request I went with them to explore up North Creek and on the mountains 15 or 20 miles above Virgin City whence we found a plenty of good fine timber too good herds grounds and on North Creek six miles above the City a good mill seat. I had secured myself about nine acres of land across the river from town, besides the few acres before mentioned near the mouth of North Creek and preparing to build me a house over the river and while going to cut timber for that purpose I was met by Brother Snow and told to go and build a sawmill up North Creek, so I gave up my land and prepared to fill the mission he gave me. About the first of December. I went up to my old place Fort Johnson to move down my wife Janet and bring my sheep and other stock and I arrived back on the 22 of the same month. My first child by my wife Margaret was born in Virgin city, Kane County, Utah, on the 23 of December 1862. at 11 o'clock, in the evening. We gave her the name of Esther Ellis after the name of my mothers mother. On the 24th I moved my stock up North Creek to the place where the mill seat was located. On the 25th the great rain commenced and continued about 40 days and raised North Creek and Virgin River so high that hundreds of acres of good farming lands along the course was carried away. I soon built a place to live in and in January 1862 moved up my wife Janet. I then went to work clearing and fencing land and in the spring went and brought down from my old place Fort Johnson my stock of my orchard and nursery trees and planted them out on North Creek and at the same time I rented out my old farm to my son Seth and moved down my wife Susan to my place on North Creek. January 5th, 1863. I moved my wife Margaret up to my place on North Creek, while my wife Susan went down and stopped in my house in Virgin City. I then hired hands and went to work at the mill in good earnest and had it completed and running in the spring and in September I went with my wives Susan and Margaret to Salt Lake City and attended the October Conference, and had Margaret sealed to me in the endowment house. Across the Alter Brother Wilford Woodruff officiated, and after visiting my friends and selling my house and lot in Virgin City to my brother William B. Johnson of Salt Lake City, I returned home in the latter part of November. In the fall and winter of 1863 and 64 there was a small town laid out on North Creek about one and a half miles below the mill and named Mountain Dell which contained about 10-15 families. August 17, 1865. My second child, Mary Elizabeth, by my wife Margaret was born between 11 and 12 o'clock in the morning at my mill place near Mountain Dell, Kane County, Utah. In the winter of 1865 my son Nephi (being President at Virgin River City) came up and organized a branch of the church of about 40 members called the Mountain Dell branch, and I was appointed President with Rufus Allen and William Isom my counselors. November 4, 1865. This day my son James F. of 13 years of age received a very severe accidental gunshot of cut slugs in his right heel which cut the cord and bones of his heel mostly to pieces. Some of the slugs came out at the instep, this accident was very painful and heart rending not only to himself but the whole family. He was confined to his bed and to the house about six months before he could walk. The Navajo and other Indians having become very troublesome, the settlements between the Colorado and Virgin River were all called to come in and the small settlement in other places were counseled to come in strengthen up the larger ones therefore the little town of Mountain Dell on North Creek had to be broken up and moved to Virgin City. Sometime about the first of June Brother Snow came up from St. George to visit the settlements on the river and I invited him to come up and see my place at the mill for I had built a good saw mill and had water sufficient to saw all the logs that would ever be brought to it and water all the land that was worth farming on the Creek. I also had planted about thirteen acres to various kinds of fruit trees and grape vines, and had the best Apple orchard in all the southern country and been to great labors in fencing, ditching, and making a good farm and thought he would certainly appreciate my labors and acknowledge my mission honorably fulfilled. But instead of that he censured me very highly and said things that I don't feel to mention. And for what cause has never told me, neither have I found out to this day. And when I saw that he did not sustain me in the mission he gave me, when I knew that I had filled it according to the best of my ability and knowledge I was sick at heart and discouraged, and resolved to leave the place as soon as I could get it off from my hands, for this cause I sold out to Joseph with William Black and made writing on the 9th of July, 1866, I then moved my family down to Virgin City into a cabin that I had built on my son Nephi's lot. October 9, 1866. My sixth child Carlos by wife Janet was stillborn a fair full grown child. And on the same day my oldest daughter my Janet, Janet Maure, was married to Jesse N. Smith in the endowment house in Salt Lake City. December 1, 1866. My third child by wife Margaret, Joseph Hills, was born about 1 o'clock in the morning at Virgin City. We stopped there through the winter in the spring of 1867 I built a cabin across the river on the same ground I was about to build the mill up North Creek. I also cleared off fenced and planted to orchard trees vines and nursery stock about 5 or 6 acres of land on the river bottom near by, which cost much labor for the ground was very uneven and had to be leveled with the shovel. The trees were large and many of them commencing to bear. In the fall I built two adobe houses and built up the inside of my board cabin with adobes (which was over twenty feet square) and made it into two rooms this with the two houses that I had built made us good quarters for the winter. Sometime in the latter part of December there was a heavy rain storm which raised the streams tremendously and North Creek came up so high that it washed out one half or three fourths of an acre of my orchard land opposite its mouth. This event discouraged me in my prospects for an orchard and vineyard for I thought perhaps the next flood of the same kind might sweep off my land and destroy all my labors. I therefore concluded to seek a place somewhere else. Where I could build and plant with more safety, and so I went down to St. George and look about that place, Middleton, Washington, and Harrisburg, but could find no place that suited me that I could purchase upon any reasonable terms. Towards Spring Bishop Willis of Toquerville requested me to take a look at South Ash Creek. So I done as he requested me and found the possibilities for orchard and vine growing better than I expected, so I bought out Brother Ralph, (the only settler at the place) and some other claims which amounted to about thirty acres of land and cost me one thousand two hundred and fifty dollars. March 1st 1868. I moved my wife Janet onto the place and commenced fencing and planting out trees and vines ( I let my son Nephi have all that he could make from my place on the river which had cost me over two thousand dollars in labor and means, for getting water out again, for the flood had swept away the water ditch.) I soon built a board cabin and got into it, which made us quite comfortable for the summer. July 6, 1868. This day myself and three wives attended the celebration of the thirtieth anniversary of the departure of the remnant of the Saints that were left at Kirtland in the Kirtland camp which occurred on the sixth of July 1838. The Celebration took place in the Hall at St. George, the hall was densely crowded with saints from the different settlements, many of the old members of the camp were present. Some of which made short but appropriate and energetic speeches upon the subjects of the persecution of the Saints, their expulsion from Ohio, their journey through the states and arrival at Farr West in the fall of 1838, when the saints were finally being expelled from Missouri, etc. A little after twelve o'clock the whole assembly partook of an excellent dinner prepared mostly by the old members of the camp, after dinner they all prepared to another apartment where dancing and singing and speech making were kept up until about 12 or one o'clock at night when all dispersed to their home. In the fall I built two more cabins and moved my other wives Susan and Margaret over from Virgin City and on the 16th of April 1869 Ezekiel, my fourth child by Margaret was born about three o'clock in the evening at Bellevue, Kane County, Utah. In the fall, I had very good crops although the locusts were very troublesome, through the summer. June 22nd, 1870. Myself with three wives, Susan, Janet, and Margaret and my son James with two teams started for Salt Lake City and arrived at the City on the second day of July and stopped at my brother William D. Johnson's and on the sixth day Susan and myself with my sister Esther M. LaBaron went to the endowment house and were baptized and sealed for the following persons: I was baptized and sealed for Joseph Hills, Jabez Hills, Joseph Hills, Joel Hills, and Enoch Forbush. Esther M. LaBaron was baptized and sealed for Esther Hills, wife of Joseph Hills, Margaret Hills, wife of Jabez Hills, Milly Hills, wife of Joseph Hills, Rhoda Hills, wife of Joel Hills, and Polly Forbush, wife of Enoch Forbush. July 9th. Susan, Janet and James started to go and visit our friends at Logan, Cache County. July 11th. Myself and Margaret started for home and arrived July 23 and found those of my family there all well, but the water was mostly dried up so that our crops was very poor this season. In the fall my brother William Johnson from Salt Lake City with his family moved down to Washington in Washington County, and my brother in law David T. LaBaron and family came down from the city on a visit for the winter, and also my brother Benjamin F. Johnson and family from Mona, Juab county, all came down on a visit through the winter, and at Christmas we had a general family meeting the St. George Hall at St. George. President Brigham Young, George A. Smith and Erastus Snow were present, the house was crowded. We had supper in the evening after which we had speeches, dancing, singing, etc. Had a good time and broke up about 12 o'clock. January 2, 1871. I was ordained a Patriarch in the Church of Jesus Christ of Latter Day Saints under the hands of President Brigham Young, George A. Smith being the mouth. About this time President Young suggested to us that the Johnson family have what was called the Spring Canyon Ranch twelve miles north of Kanab for a stock race and for all the family who wished to settle there, and requested us to go and look at it which we agreed to do as soon as we conveniently could. January 23rd, 1871. Myself being as St. George at the house of my brother Joseph and most of the family being present, the requested me to give them Patriarchal or Father's Blessings, which I did in the following order: Joseph E. Johnson, Benjamin F. Johnson, George W. Johnson, William D. Johnson, David T. Labaron, my sister, Esther M. LeBaron, Harriet Johnson, Eliza Johnson, Benjamin F. Johnson, Jr., Horatio Picket, Esther Ellis LeBaron, and Nancy H. Babbitt, being 14 in number. The above blessings are recorded in Book No. 1 of the records of Patriarchal Blessings under the hand of Joel H. Johnson. The next morning I started for home and arrived late in the evening, having previously made arrangements to meet my brothers and some others at Virgin City on our way out to look at Spring Canyon Ranch near Kanab, agreeable to the request of President Young. We according went our and found a beautiful canyon from half a mile wide several miles long covered with grass, with small springs coming out at the bluffs on each side, and a small beautiful stream running from the mouth of the Canyon, plenty of excelled grass for meadow and stock range extending for many miles around. We were highly pleased with the place and concluded to accept of the President's offer. Therefore we made arrangements for some of us to move there in the Spring and start a cooperative Stock Association for herding stock raising and dairy purposes, after which we all returned home. In the latter part of March I moved my wife Susan and her two boys Joel and Lamon out to Johnson and my brother William, who was stopping at Washington moved out his family also and my brother Joseph sent out three young men. We took tolls, grain and seeds of many kinds for farming and gardening, and also trees and vines for orchards and vineyards. My two oldest sons Sixtus and Nephi also moved part of their families out and all went to work. Some to planting out fruit trees and vines, some to building cabins, other to plowing, planting, garden making, etc. I then started for home and met my brother Benjamin at Virgin City on his way out to Johnson with farming tools or implements, grains, seeds, etc. Sometime in the month of March my brother-in-law George Wilson came up from the muddy to my house and was taken sick with the mountain fever, and did not recover until the last of April. And about the first of May we took a trip to Johnson and found that the water had mostly died up and the prospect very small to raise crops there, although the boys kept on planting and sowing and looking for rain, we stopped a few days and came home and found that the grasshoppers had destroyed all that I had planted. Seeing the I was going to fail in both places to make a crop, I suggested to Brother Wilson that we go and look out a place on which to build a saw mill (he being a good millwright), he though it would be a good plan, so we started with a team and went up by Parowan and over the mountain to Panguitch, we told Bishop Sevy our business, and he though we had better build a mill eight miles above that place on the Sevier River, but we concluded to go and look in Long Valley for Brother Wilson had acquaintances there. So the next day we went on our journey and stopped and looked at the place Brother Sevy mentioned on the Sevier River. We found a good place for farming, a good mill sight and plenty of good sawing timber nearby, but we went on over to Long Valley and found that Joseph W. Young had agreed to build a saw mill there, so we crossed over the mountain into Kanab Canyon and down to Kanab and out round to Johnson, and found the boys nearly discouraged about making crops on account of the drought. We stopped a few days and organized a Cooperative Stock Association, and then we started for home down the Sevier River and my son David went with us and when we came to the mill place we had looked out, we stopped and took another look and concluded to make a permanent location there for farming and mill building. We then came home and Brother Wilson moved his family to Panguitch. They all took shares in the mill and went to work, and I agreed to furnish provision and mill irons. In September I took out a load of Provisions and brought out David's share of the mill and he went to Spring Lake Villa. Almera W., my fifth child by my wife Margaret was born October 25, 1871, at 11 o'clock in the evening at Bellevue. November 17, 1871. I went to St. George to see President Young and George A. Smith and gave them a description of out place on the Sevier and an account of what we are doing there. They were much pleased with what I told them and instructed me to take out a surveyor and survey the land and a town plot and get all the settles that I could. December 31. Went to St. George and spent New Year's Day with my brother Joseph, and returned home January 3rd. Weather very warm and beautiful for this season of the year. January 4th. Went to Virgin City to attend to home business and returned home on Sunday the 7th of January. Saturday 13th. Went to Toquerville and returned home next day. February 20th. Went north to sell trees, vines, etc, at Harmony, gave a lecture on fruit growing and vines and went out to Fort Hamilton and stopped all night at Peter Fifes. Sold a few trees in the morning and went on to Parowan. Made a few sales and returned home on the 25th. March 13th. Started to move Janet to my mill place on the Sevier River which I call Hillsdale, it being a valley between the hills. Hills also being a part of my own name came to Parowan on the evening of the 14th. Attended the School of the Prophets. On the 16th, gave them a lecture on the Word of Wisdom, etc. Started for Panguitch on the 17th, arrived on the 18th and found Brother Wilson and family all well. Stopped over night. Next day moved all up to Hillsdale. Brother Wilson and family went into the house and Janet and family went into the Blacksmith Shop, the next day we commenced anew our labors on the mill. Joel went to Johnson and brought over the most of my stock, and then went to Red Creek to Mill. I labored hauling timber for the mill, making garden, etc. until the 22nd of April, when I started for home at Bellevue and arrived on the 26th and found all well. May 10th. I went over to Virgin City to see the boys and do some business, and returned home the next day. May 13th. Started to go to Hillsdale in company with Brother James C. Snow, surveyor for Kane County to survey up the land and lay out a town. Camped for the night between Hamilton and Cedar City. May 14th. Commenced raining early in the morning, rained till noon and then commenced snowing, with cold wind in the north. Got to summit about the middle of the afternoon. Stopped all night while it continued snowing and all the next day, snow fell 19 or 20 inches deep, on the 16th went from Summit to Parowan. May 17th. Brother Snow concluded to return home and I started for Hillsdale to which place I arrived on Sunday 19th over dreadful roads. Stopped at Hillsdale three weeks lacking one day, and started on the 8th of June and arrived home on the 10th. Eloheim, truth, virtue and celestial lives. The people had a first rate time, at the close all appeared satisfied and happy, and I returned back to Hillsdale. Monday August 25th. Edward Dalton, County Surveyor for Iron County, came over to Survey land for the Hillsdale settlement. He laid out a small town plot and surveyed a strip of land about 5 miles long, about equal distance each way from the mill up and down the river and one hundred and ninety rods wide. I expected to have started the mill before I left, but when we left the water into the race or ditch we found that it would not carry a sufficient quantity to run it therefore had to enlarge the race. Wednesday August 7th. Started for home and arrived on Friday the 9th. September 24th. I left home to go again to Hillsdale with a load of fruit and arrived there on the 28th and found all well. Let out my share of the mill, being three fourths to Nephi and Seth one year for half the profits. Settled up my mill account with Brother Wilson and others. Found something due me besides three fourths of the mill. I hauled a few logs. Sold lumber, raised a little money, helped fix up a house for Janet and made arrangement to build one for Susan. And started for Bellevue on the 13th or October. Stopped at Panguich all night and arrived home on the 17th and found all well. Who have walked the narrow way. November 12th. Went to Virgin City to do business with Sixtus and Nephi. Sold Nephi a yoke of oxen and bought four hives of bees and having bargained for two hives sometime before I bought home six hives on the 14th. January 19th, 1873. From the above date to the present I have labored on the farm at Bellevue, building stables, fences, etc., preparatory for the summers operations. Or thousands in treasures could be. And soon you became my dear bride. As that of true faithful wife. Because of thy kindness to me. January 21st, 1873. Went down to St. George to see the President so some other business. Arrived there on the 22nd. Found the President just ready to start for Virgin City, therefore could not see him until he returned. I then concluded to stop and attend a two day meeting to be held on the following Saturday and Sunday in the St. George Tabernacle. The house was crowded with brethren and sisters from other settlements as well as St. George. The next that the speakers mostly dwelt upon was "except ye are one, ye are not mine", the most of the teaching was for the Saints to be one and cease working for, and feeding the Gentiles. But let them alone and go to with their mights and build up Zion. To cease hauling everything they had to spare to Peoche to build up the Gentiles, but bring it to St. George and build up the Temple and Kingdom of God. The President then called for all those who were willing to let Peoche alone and not go there to work or haul anything to them, but would help build up Zion, and had been in the Church forty years to rise up and hold up their right hand, there was ten that arose. He then called for those that had been members of the church 25 years and there was a good show, and so on down to those that had been in the church 15 years, reducing five years each time, I was truly thankful to see a beginning made to introduce the Saints today to the first Commandment given to the Church, that was to "Come out of Babylon, Oh my people, be ye Separate, TOUCH NOT, TASTE NOT, handle not of her unclean things" this commandment of the Church as a people have never kept, for this cause we have been mobbed and driven from place to place and still the spirit of mobocracy is after us. We have constantly sought after unclean things of the Gentiles of Babylon, such as their strong drinks, tobacco, tea, coffee, bacon, and all the round of their canned and bottled fruits. and provisions, candies, etc. With their clothing, fashions, manners, customs, and many of their practices, while the Lord said that those things were unclean and not for the good of man. And that the beauty of our apparel should be of the workmanship of our own fingers. While we continue to follow after Babylon, the Spirit of Babylon will follow us and our children and we can't help ourselves. I have refused to use their unclean things and to follow their fashions for the last forty years and have always preached against it and feel thankful that the first step is taken to bring the Saints out of Babylon. I returned home from St. George on Tuesday the 28th and on Friday the 31st went down to Toquerviulle to do business with my son Seth and towards evening partook of an excellent supper in the hall prepared for the President and party, but the President was not there. I returned home on Saturday the 1st of February. April 11th, 1873. A few days back has been very cold and stormy with heavy freezing. Apricots and peaches mostly killed. I started today to go to Parowan to get some potatoes for planting and do some other business. Arrived there about noon the next day being Saturday, done up my business satisfactorily, and tarried over the Sabbath and preached to the people, and had a very interesting time in showing the people their unwillingness to come out of Babylon according to the commandments of God, and the Consequences that did and would follow. They paid good attention and most of them seemed to receive the word with gladness. I started for home on Monday at noon and arrived home on Tuesday a little after sundown. My wife Janet had come over from Hillsdale to Parowan where I found her in tolerable good health and was very glad to see her, not having had the privilege for nearly or quite six months. This tongue can never tell. With crown of endless l lives. June 5th, 1873. Started to go to Hillsdale with my little girl Mary, arrived at Parowan on the 6th about noon. Got Brother Daniel Allen to repair my harness and went on and camped for the night near the top of the mountain. Next day arrived at Hillsdale and found all well. I settled with George Wilson and bought out his share of the mill for which I paid him five hundred dollars, mostly in stock. Rented the mill to Nephi and Seth, some other necessary business and started for Bellevue on the Seventeenth and arrived on the 20th. Found all well. It seemed so much like you. And kiss me back again. and lift the sinking up. When hid beneath the soil. Those who are blessed by thee. God then will hear your prayers. Yet never bought or sold. A true and faithful friend. In time, or at its end. Of what is just and tie. Will bring you safely through. In childhood, age, and youth. This precious gem, is truth. October 28th, 1873. Today my daughter Susan Martineau with her oldest son Henry and four small children arrived at house from Logan, Cache County, Utah. I was very glad of her visit having not seen her for twelve years. She stopped a week and went over to Virgin City to visit her sister Sariah Workman and stopped with her a weekend and returned. Yet wish my long loved darling well. That I may love and bless thee still. With light and love shall f ill thy breast. And while eternity shall last. December 30, 1873. My health has been very poor the last two weeks, not able to do any work. On the third day of this month there commenced a dreadful snow storm, such as has never been known in this country. It last six days snowing night and day but melting a good deal at the same time. Which left it hard on the ground from twenty inches to two feet deep, which made the roads impassable for several days and took much labor to break them so that teams could pass. Many loads of potatoes on the road between Bellevue and Kanarrah were left and froze solid. The snow still covers the ground from eight to ten inches deep. Nearly fifty years have passed. Falling from her joyful tounge. Nearly forty years have passed. By the shadows of the day. From the pure Celestial clime. Two and seventy years have passed. April 9, 1874. This day my sixth child of my wife Margaret was born at a quarter past ten o'clock in the evening, being her third son. 17th. Today I blessed my little son, it being the eighth day since he was born and called his name Jeremiah, it being given by inspiration several months before he was born. June 30th. Today I started to go to Hillsdale with my wife Susan. Went to Hamiltons Fort and stopped at Sister Fifes all night. Went to Parowan next day and stopped all night. Next morning started on, and camped for the night. Next morning started on, and camped for the night in the canyon below Bear Valley. Next day arrive at Hillsdale about noon on Friday. On Sunday preached to the people and blessed two infant grandchildren, one the son of my Nephi, and the other the son of my son David, and on Tuesday the 7th of July, started home and arrived on Friday the 10th. Saturday the 11th there came over Bellevue the worst hail storm I ever saw making almost entire destruction of all kinds off fruit and vegetation. That fills your kind heart with despair. To mansions prepared for his wife. To crown you with glory, dear girl. Before your childhood days were fled. And make your presence all complete. Which filled your heart with sweet delight. Oh! Shall we ever more be there. Which shows that winter ports are near. August 25, 1874. Today there came over Bellevue another heavy hail and rain storm, which done much damage to what fruit and vegetables there were left from the other storm of the 11th of July. That are falling here and there. Who so full of joy as she. That her care should be our lot. When she came with us to dwell. A prophet he shall be. And help you fill your place. And all my joys increase. Their councils all to know. With crowns and kingdoms gained. There was another dreadful hail storm at about four o'clock this afternoon, and destroyed much of the fruit left from the other storms. My prospects for bread and clothing for a large family mostly cut off but it is the Lords business to provide and he knows what is for our best good. In the cold grave sleeping. When our cares on us crowd. To a woe stricken heart. December 1, 1874. Today I baptized and confirmed my little son Joseph Hills he being eight years old today. He is to become a printer and publisher not only of my book but many others brought forth by the Saints of the last day, and is to become a great man in Israel by publishing the Gospel to many people. The Lord bless him forever. And show thy will to me. For thou wilt bless thy friends. For kingdoms with their pomp of state. To gain of man the noblest name. For all the treasure Kings obtain. For all the glory earth can give. In the afternoon my sons Nephi and Seth came over from Hillsdale. Also Sixtus and Joel from Johnson with my wife Susan and her son David from Toquerville, all came to visit father on his birthday. I was very glad to see so many of my family together once more. March 24th. We all took dinner together and had a good time in the afternoon. We all came together with those that are there and I organized them into the order of the sons of Joel. I was chosen president, Sixtus and Nephi being counselors, and Seth, secretary. The object of this organization is to enter into an organized system of keeping a record of and educating the sons and daughters of Joel and to keep them from running astray after habits, fashions, customs, and the unclean things of the Gentiles and to observe strictly the laws, rules, and customs of the Saints of the Church of Jesus Christ of Latter Day Saints. December 6th, 1875. Since the last date I have labored mostly on my farm, made tolerable good crops. My health has been tolerably good for an old man. Yesterday attended meeting at Brother Sylvesters, confirmed three children that had been baptized and blessed a small child of Brother Joseph A. Birch. Gave him the name of George A. Sylvester Birch. Our prayer to God has been day and night for a long time to give me wisdom, knowledge, and power to know and do his will on the earth and to escape the power of the destroyer and live to see the time when there shall not be a dog to move his tounge against the pure in heart in all his holy mountain. December 15th. I have not written much since I returned from my mission to the states in 1860. Since that time my health has been better that it had been for many years. Since then I have been moved about by council and my own judgement so often that I have had but little time or opportunity to write, neither have I had a convenient place for that purpose and have had to labor almost unceasingly to support my family having but little or no means to go on or to assist me. Nevertheless, I have written a few poems now and then. January 5, 1876. I went to St. George to do some business and had a very rainy time. Stopped with my brother Joseph E. Johnson until Saturday. I went down and saw the temple, did my business, and returned to Hannah Johnson's at Washington. Gave her a Patriarchal or Fathers blessing, also her son in law William Gott. I also blessed the two little children of James Carlton son in law to my brother Joseph. March 15th, 1876. Received a telegram from Salt Lake City informing me that my sister Esther M. LeBaron had died in the morning at 7 o'clock. And their redemption made complete. March 23rd, 1876. Today being my 74th birthday, I expected all my sons and many others of my family to meet at my house to celebrate the occasions by coming to a better understanding of and assisting to perfect the order of the sons of Joel, but was very disappointed for only David, Joel, and Almon of my sons were there with Henry Martineau, my grandson. David's and Henry's wives with Anna Hilton my granddaughter and Nancy Riggs my niece were present. There were all except my two wives Janet and Margaret with their children. We had no records of the last meeting, therefore done no business. After dinner we all met together and I gave them a lecture on various subjects, appertaining to a common course off conduct and family matters. We had a good time although but few were present. In the evening I gave a fathers blessing to my oldest daughter, Sariah and also to Anna Hilton, my granddaughter, and to Almon B., my youngest son by my wife Susan. April 6th. Today my seventh child by my wife Margaret was born at half past five o'clock in the morning, a daughter. To guide her through life. May 12th, 1876. I went to st. George and stopped with my brother J.E. Johnson and attended conference on Saturday and Sunday and heard Presidents Young and Wells preach with several others of the Elders who gave a first rate instruction while the spirit of the Lord was truly manifest among speakers and hearers. I had a very good time and returned home on Tuesday 16th. While there I gave blessings to several of my kindred and on my return, found my son in law James H. Martineau at my house very sick with cough and pain in his breast. Laid hands on him and he seemed much better. I also gave him a patriarchal or fathers blessing. May 31st. Last night a terrible wind blew like a hurricane all night, and strewed the ground with apples, pears, peaches, plums, and cherries, and all kinds of tree fruit. Grape vines terribly whipped to pieces and many apple trees nearly stripped of their foliage. June 21st, 1876. Wednesday evening, my son James F. Johnson and Mary J Wilson were married at his mothers house by myself. June 24th. I went to Kanarrah on business. Preached to the people on Sunday. Had a very good time with good attention from the people and returned home on Monday. And to me come higher. March 23, 1877. Had lines written for my 75th birthday not recorded through mistake. And sundered many a kindred tie. And she beyond this world of strife. Has passed away! that heavenly boon. At Mary's death, Esther was sick nigh unto death with the same disease and had been all through her sickness. Several of the other children also were sick, and my health was very poor indeed. We had no family gathering on my birthday, therefore, done no business in regard to the order of the sons of Joel. April 15th, 1877. My health continues very poor. Not able to do any business of consequence and we all feel very lonesome and sad on account of Mary's death. While gloom upon them fell. The wishes of their Lord. Like Abraham's seed may their offspring increase. To cast off Satans chain. In peace and safety dwell. March 22nd, 1878. My mind for the past two days has been occupied in writing my seventy sixth birthday review, which is recorded in another book. March 23rd. This being my birthday my sons Sixtus and Nephi with their wives (or parts of families) and Joel and Almon came over from Johnson with Sariah my oldest daughter from Virgin City to Celebrate their father's birthday, it being my 76th. We had dinner at 2 o'clock and the next morning I gave Patriarchal or Father's blessings to several of my family. In the afternoon we met together to talk over and counsel about family matters. I gave them counsel and instruction and we were all edified and blessed. The next day all returned home. Tuesday 25th. Today my eight child by my wife Margaret was born at four o'clock in the morning, a son. Who are or may be owned thy sons. To know and understand the law. In the true order of thy son. And fill the earth with light divine. January 11th, 1879. Today I started on the mission given my by President John Taylor together up my family and colonize them at some place in Arizona, and organize them in the unified order. I went to Virgin City and stopped for the night, held meetings at the usual place, gave a lecture to the people, had a large gathering, good attention, and a good time. Next day drove to Cedar Ridge and camped for the night. The next day drove to Kanab and stopped for the night. Had no meeting, their house had just been painted inside and not fit for use. Next day drove to Johnson and stopped with my son Nephi, my sons came together. I instructed them in relation to the mission given my by President Taylor, they all seem willing to hearken. In the work of her salvation. Till they all shall be defeated. While the wicked have their part, with the Devil. So perfect is their rest. That mortals have to bear. There's naught but grief and pain. And bid our dead arise. March 16, 1879. Started in company with my wives Susan and Janet and daughter Esther with my son David and family to go to St. George to do some Temple Work for ourselves and dead. Drove to Harrisburg and camped for the night. Next day arrived at St. George. March 18th. Commenced work in the Temple. I received endowments in behalf of my father. We labored in the Temple for ourselves and dead until Friday afternoon and returned home. March 24th. Started with my wife Margaret and child and little son Ezekiel to go to Hillsdale. Stopped with Brother Allen at Kanarrah overnight. Next day went to Parowan and stopped with my sister. Next day went to Panguitch and stopped with Alma Barney and on the 27th arrived in Hillsdale about noon. Preached in the evening to the people who gave good attention. Next day looked about some to see some to see what I had better do. For I had understood that Brother Taylor had finally left the matter of my Arizona mission to Brother Snow who decided that I had pioneered enough and was too old to make a new settlement in the new country. He counseled me if I wished to leave Bellevue to Hillsdale and build a flouring mill. March 29th. Preached to the people again in the evening and next morning started for home and came to Panguitch on Sunday the 30th and preached to the people at 2 o'clock and had a good congregation and a good time. Next day started for home and came to Parowan and preached in the evening to a good congregation and had a good time in speaking and attention from the people. Arrived home on Wednesday, April 2nd, 1879. April 7th, 1879. Bargained or sold my farm orchards, vineyards, etc. to Andrew F. Grogerson for the sum of $3,000. April 9th. Today my daughter Julia Ann Orton died in childbirth at Parowan. Her child, a daughter, was stillborn. She left eight children and had lost four. I attended her funeral on the eleventh. Her corpse was carried directly to the graveyard. All Parowan seemed to be there. An immense congregation. I stepped up into a wagon and spoke to them, about twenty minutes, and I seldom saw such a gust of grief in my life as was manifest from old and young, male and female with the general expression. She was such a good woman. She was a kind, virtuous, and faithful companion, a tender loving and affectionate mother. Her loss can never again be made good to her husband, children and friends, until she takes up her tabernacle again in the resurrection. To reign with Christ again. April 18th. Started for Hillsdale and arrived there on Monday, the 21 expecting to meet my son Nephi there, but was disappointed. Done some business in regard to the mill, building and moving. Preached to the people on Sunday the 27th and started for home on Monday, and arrived on the first day of May. Devoid of doubt and fear. That dwell on land or sea. June 5th, 1879. Started for Hillsdale in company with my little son Ezekiel, who drove my carriage and also with my son in law David Frederick who drove a team for me loaded with dried fruit and dry goods which I took over to pay for work on the mill. But when I came there I was told by my son Seth that on account of the extreme drought at Johnson and vicinity, President Snow had released my son Sixtus from the office of Bishop at Johnson and advised him to move his flocks of sheep, goats, and cattle into Arizona and told him that I had better go with him if I still wanted to go. I then drove over to Johnson to see my son Sixtus on the subject, and consulting with him on the subject, I concluded to give up mill building and moving to Hillsdale and go to Arizona with my son Seth to sell for me and preached to the people on Sunday June 15th and found that there was no water within three or four miles of the place only what was hauled from Toquerville. With front trees and vegetables of every kind all drying up and dying. And humbly walk with thee. And like a faithful child. That I am called to fill. Praise Heaven and Earth, His Holy name. There was no celebration here. The most of the people having moved away on account of the drought. And safe enforce thy laws. And put their hosts in flight. Shall find her at the head. Shall find themselves the tail. Seal us Lord forever thine. They find his hand their works abating. Will find themselves the minority. He would come out and vex the nation. August 29th, 1879. Started to go to Parowan after the flour arrived there. In the afternoon of the 30th found the family of my son in law Samuel Orton sick and in affliction. They had buried one son the day before and that evening another died and was buried on Sunday the first of September. This is the fourth child they have lost since the 9th of April when their mother died. All from the affects of Scarlet fever. I preached to the people on the occasion and had a good time for the spirit of the Lord was manifest to all. On Monday I started home with my flour and arrived on Tuesday the 3rd of September. Found all well. And found of every joy. Like night before the sun. October 6, 1879. The first snow on the mountains this fall fell last night with a little rain in the valley but not enough to bring any water. October 13th. A little more snow on the mountain last night, but no rain to do any good in the valleys. December 5th, 1879. I was taken sick on the 27th or October with a dreadful cough and a death like weakness pervading my whole system. I have been confined to my bed and house most of the time since. Not able to do any business whatever. I have felt a little better for the last few days, but very weak yet. There has been some rain with a good deal of snow on the mountains, but not water damming down the stream to haul from Toquerville still. And their expulsion to complete. Seal me with thine forever. From every toil and care. To dwell a thousand years. Be thou my daily guide. I have been led by thee. To know and do thy will. January 28th. Last night there came of heavy snow storm from the north with high wind which is drifting the snow badly. February 2nd. For the last four days there has been a terrible wind drifting all the snow in the roads into heaps and covering them with sand. Terrible cold. Candlemas Day but not a cloud to be seen. But walk the narrow way. To walk the narrow way. And crowns of glory win. March 12th. Yesterday was a very fine, warm day, and I sent Joseph and Ezekiel to Parowan for flour, and last night there came up a storm from the North, and it has been very stormy with snow and high wind all day. hope the boys will return safe. March 15th. The boys returned today about noon having suffered much with cold. March 19th. Went to Silver Reef to see my brother, but he was gone to St. George. Done no business and came home. That all her children may be thine. And wickedness may have an end. As Zions Savior, Lord, and King. April 6th, 1880. This day completed the fiftieth year since the organization of the Church of Jesus Christ of Latter Day Saints. I was baptized into said Church on the first day of June, 1831, which makes me a member of the church forty nine years, lacking one month and twenty five days. My age at this date is seventy eight years and fourteen days. I have raised up three families of children to manhood and am now raising my fourth consisting of a wife and six children, two having died. I have no help except two small boys, and it is very difficult to hire help therefore, I have to labor almost incessantly. The boys of my other families have all gone for themselves long ago. Some of them ought to have stopped and worked with their father, which would have been a great blessing to themselves and their aged father, who could have spent his time in writing upon the scores of different subjects that are continually crowding in his mind, but not have to be neglected. April 25th. Went to Silver Reef to see my brother and heard letters read from A. F. McDonald of Arizona, and returned the same day. May 21, 1880. Went down to Silver Reef to see Joseph again in regard to our mission to the Gila in Arizona, and heard very encouraging letters read from an R.R. agent there giving a fine description of the country and returned the same day. May 24th. Appointed a family meeting at my house today to instruct my family a little and to baptize my little daughter Almera Woodard Johnson. Who should have been baptized last summer, but the water all dried up so that there was no place for baptizing. I gave an invitation for all to come who wished. Quite a number came to meeting with several other children to be baptized. Brother Samuel Gould went into the water and baptized them, being five in number, after which we had meeting and confirmed them. Brother Gould gave the children very good and timely council. I then spoke to all and gave them good instruction. We had a good time. May 30th. Had another meeting at my house and I baptized Ebenezer W. McDougie and his wife, also Joseph Sylvester. After baptizing we had a meeting and confirmed them, there was quite a congregation present. I spoke to them upon many subjects of Christian duty after which Brother Guild gave them a short lecture. For He has done, and will do right. That the Johnson family celebrate this day with prayers and Thanksgiving one year from this time at Johnson. Sang We thank Thee O God for a Prophet. Benediction by William Johnson Jr.
August 10, 1881. For the last month the weather has been very hot and dry, but little rain. Hot weather and old age makes me weak that I am unable to labor or move about but little. And those who share it, must endure it. When foes are prowling round. When death looks sure and nigh. September 5th. Attended the quarterly conference at Kanab. Brothers McAllister and Blake occupied the first day upon very interesting subjects, on the second day I spoke on my first acquaintance with Joseph Smith, this first calling and organization of the different quorums of the church, the building and dedication of the Temple at Kirtland, the persecution that followed, etc. We had a very interesting time. October 17th. Today myself and wife Janet and son Ezekiel started to go to Bellevue. Went to Kanab and stopped for the night. October 18th. Today my son Nephi joined me and we went to Cedar Ridge and camped for the night. October 19th. Went to Virgin City, and stopped all night with my daughter Sariah. October 20th. Went to Silver Reef, took dinner with my brother Joseph E. and stopped all night. Went to Bellevue next day, accompanied by Andrew Gregerson and stopped with Brother James Sylvester. Settled with Gregerson who paid me three hundred dollars towards what was still due on the farm. I took his note for the balance and gave him a deed. April 22nd. Started for home. Stopped all night to Toquerville and made a preemption claim on 160 acres of land. Next morning went to Virgin City and preached to the people being Sunday. Then went to the Gould or Workman place and stopped for the night and arrived home on the 25th. December 25th, 1881. So few people at Johnson this Christmas. There was no gathering of any kind and nothing done to celebrate the day. January 1, 1882. Our new year came on Sunday. Saturday evening we had a little gathering of young folks at D. Johnsons who got up a few plays with speeches, recitations, singing. We then had pies and cakes passed around, and all seemed to have quite an enjoyable time. And sought to live with God. To live by, and sustain her laws. With thy Saints to live and reign. While o'er them thy Saints prevail. And no curse on it remain. Or on the burning plain. The summer of my heart. That ripens fruit of God. The vintage hour is nigh. That shall from it be pressed. March 10th, 1882. I showed 130 of my pamphlets containing my testimony of the truth of the Gospel of Jesus Christ as revealed by the Lord to Joseph Smith, Jr. To the senate and Legislative assembly of Congress to obtain special legislation to disenfranchise the Saints in Utah, and rob them of all their rights as American Citizens. But their greatest object is to drive them from Utah and rob them all of their possessions and property as they have before been robbed in Missouri and Illinois. March 23, 1882. This day completes the eightieth yea of my age and a few of my friends came together at my house to celebrate the day. There were present my son Nephi Johnson and family, my brother William D. Johnson and family, his son Bishop W. D. Johnson,. Jr., and family with William Law and family, and many others. I consider this one of the happiest days of my life, a day I never expected to see when afflicted with long protracted sickness and hunter at other times by scores of wicked mobbers, some with drawn revolvers and nutcher knoves, but God hath preserved my life from disease and the power of wicked men until have the glorious opportunity of celebration of my eightieth birthday. I've sought my Saviors love and grace. June 1st, 1882. This day completes the fifty first year since I was baptized unto the Church of Jesus Christ of Latter Day Saints, a few of my friends and relatives came together to celebrate the day. I read the minutes of our last meeting and related a few things that occurred in my childhood. Could remember the first application of the steam as a motive power when Fulton ran his first stream boat from New York to Albany. Could remember many of the incidents of the War of 1812 with Great Britain, heard the cannon of some battles, the battle of New Orleans took place two months after the treaty of peace. I saw the first steam boat that ran down the Ohio River, being the second one ever built. Saw the first one that ran on Lake Erie. Was acquainted with many of the soldiers of the Revolutionary war and shook hands with some of the Generals, Lafayette among the rest, had voted for most of the Presidents since Washington, etc. After which William D. Johnson, James Glover, and James F. Johnson made some remarks appropriate for the occasion. 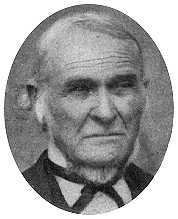 Joel Hills Johnson died September 24,1882, in Johnson, Kane County, Utah at the age of 80 years, six months and 1 day. This Journal transcribed by Bertha McGee (Joel's great grandaughter), her daughter Linda, and Linda's husband Chuck Harrington. The resulting text was marked up using HTML for web presentation by Bertha's son Scott. If you have found errors in this manuscript, please understand of the conditions that we went through. Please let us know and we will gladly research and fix them. Thanks, Bertha, Linda, Chuck, and Scott.